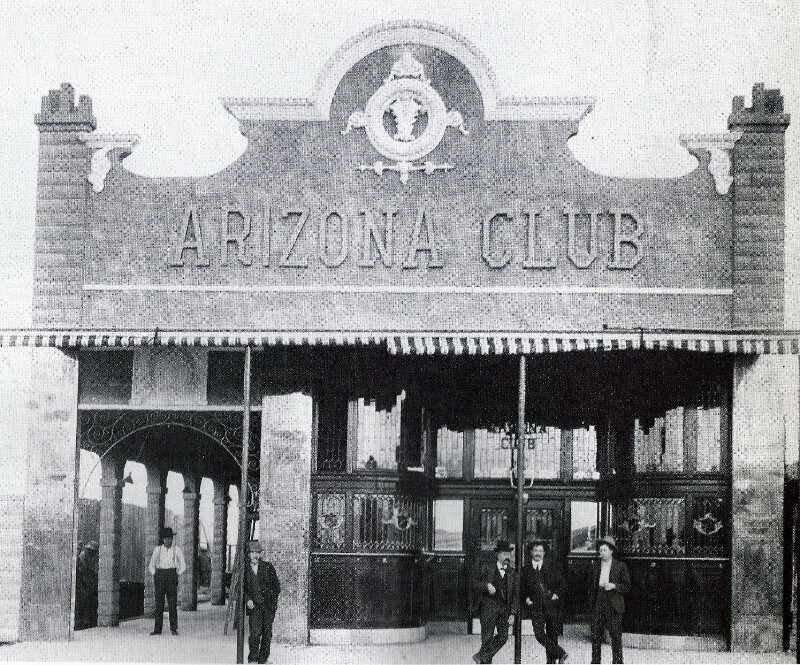 The Arizona Club (Hotel) was open from 1905 through sometime in the 1940's. 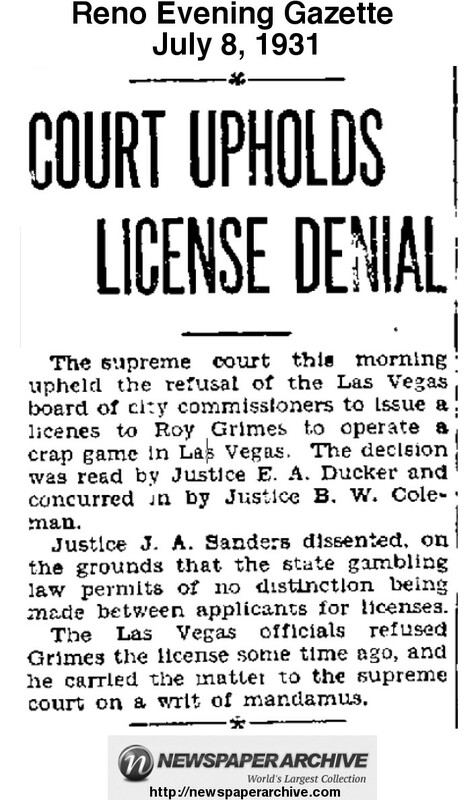 When gambling was legalized it was licensed for slots and 21. It was located in the "red light" district known as Block 16 so it's a safe bet there were plenty of games running prior to the change in the law. 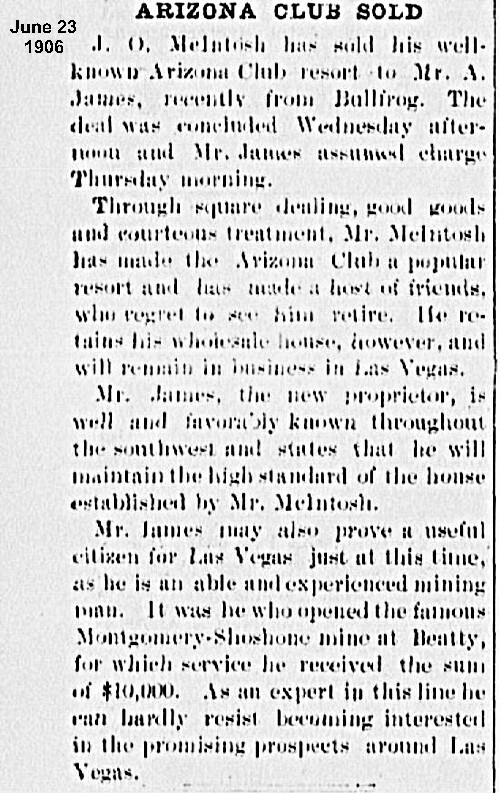 This article points out that bars in Las Vegas were left unmolested for two years while liquor sales in the country were outlawed. 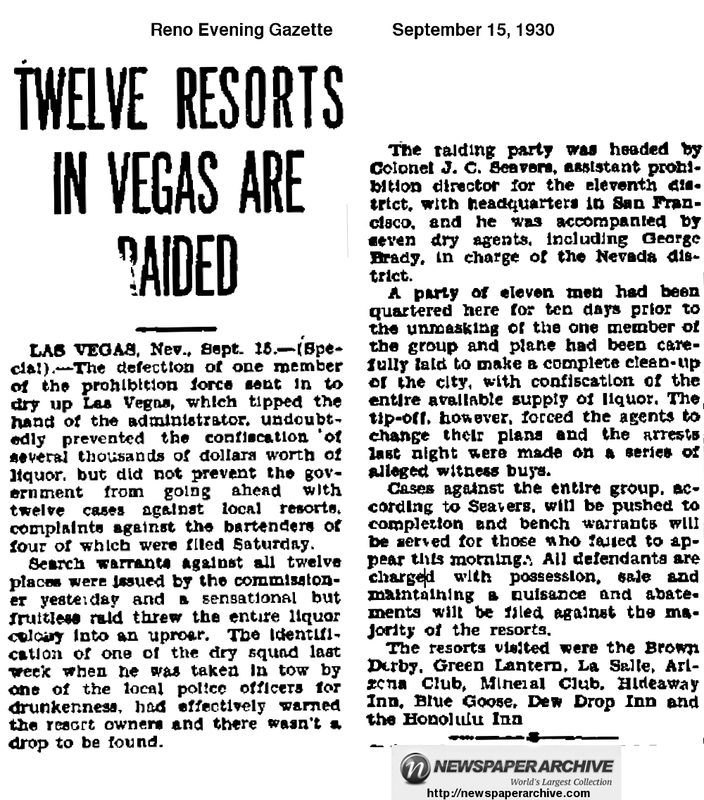 Then eight establishments were raided simultaneously by eight prohibition officers. furnished bonds for their release. Prohibition, known informally as the Volstead Act, came into force at midnight on January 17, 1920. It provided that "no person shall manufacture, sell, barter, transport, import, export, deliver, or furnish any intoxicating liquor except as authorized by this act." This failed social experiment was repealed December 5, 1933. 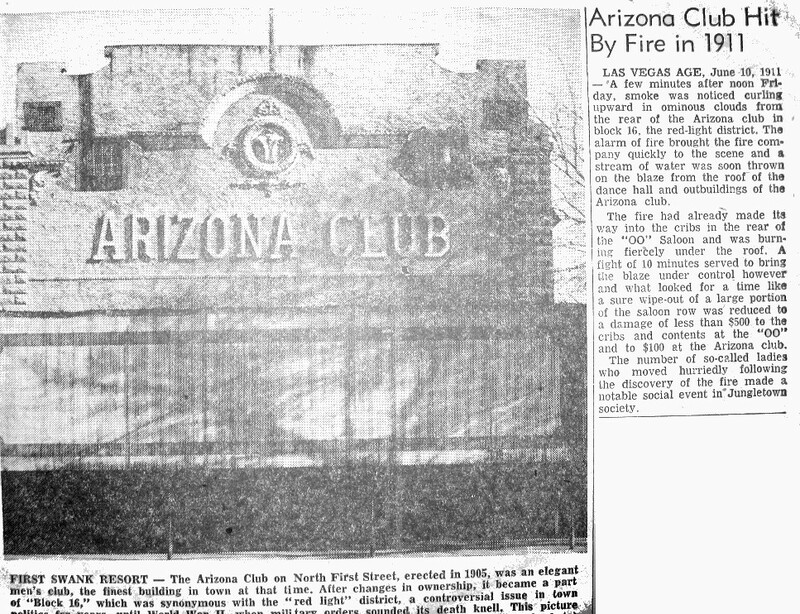 On April 10, 1929 the Arizona Club was again having problems with "Mr. Volstead's men" as it was shut down for selling illegal liquor. of current saloon license which he had refused to pay. The Arizona Club license was paid the day following the meeting and legal proceedings dropped. 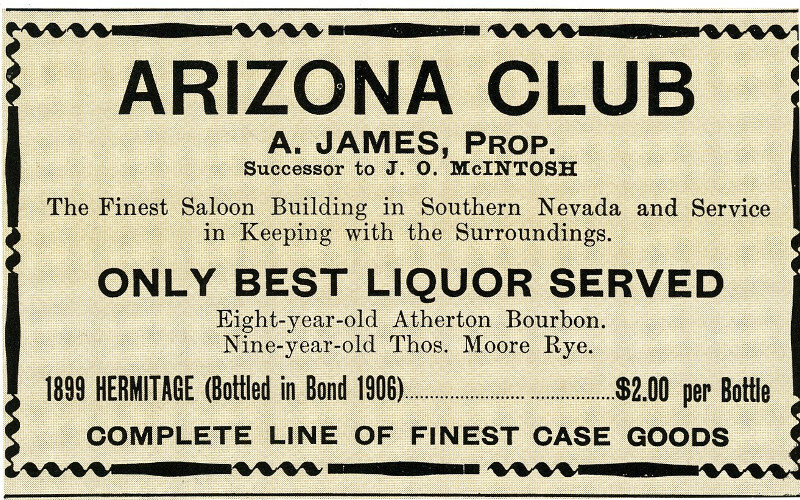 The article below describing another poorly executed raid by prohibition agents mentions a few of the Block 16 extablishmnets shown on the postcard above. Below is an early set of photographs taped together showing some of the first bars and gambling houses on block 16. The annottated addresses are my notes as best that I have been able to determine. Mind you, I’m smiling when I say this: I was never a customer in Block Sixteen. [laughs] But I can recall it very well as a small child and then later as an adult, when I was a policeman. Between Ogden and Stewart, on the east side of the street going from Fremont, the first thing would be a large vacant lot. Then came the Honolulu Club, and next was the Red Front, the Jazz, the Double O. There were a couple of others that I just can’t recall. These were houses of prostitution. They probably had bars in them in the very early days, before my recollection; reportedly, they had bars and entertainment prior to Prohibition going into effect. My recollection is that none of those houses of prostitution had a license to sell liquor. When we say houses of prostitution, I don’t suppose that there were over 40 girls involved. Each of those places had a madam as the operator. I imagine that business wasn’t heavy. On the other side of Stewart Street, at the end of First Street, a lot of the single railroad men had little cabins down by the creek. I imagine that some of the prostitutes’ customers were the single railroad men. Certainly there wasn’t tourist trade to amount to anything. With Boulder Dam starting up, with the people coming in, business did pick up. The women were not known by people around town. I think that they stayed in their area, and townspeople certainly didn’t frequent the area. Now, maybe some of the men slipped down on occasion. I don’t know! [laughs] But, it wasn’t a part of town that people went through. Oh, in the warmer months the girls would stand out in front of the place to whistle at a possible customer. As teenagers we would drive down that block to see the girls. 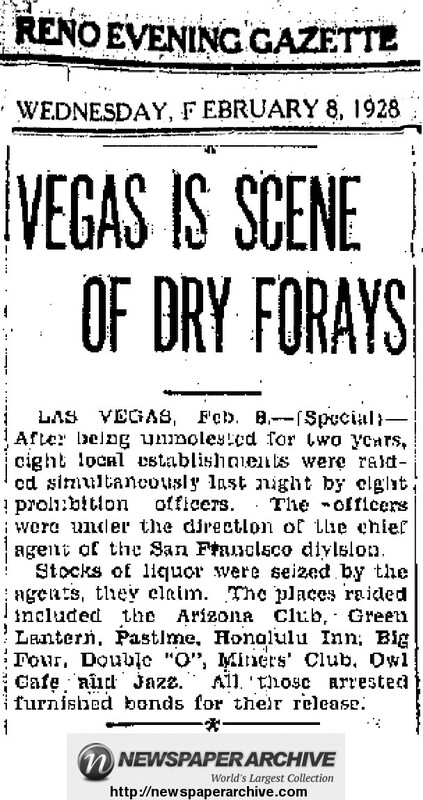 There were bars operating in town in the 1920s, and the Prohis [federal agents enforcing Prohibition] would come in. There were several places that sold liquor, and once in a while the Prohis would come in and close them up. I think everybody had something under the counter. 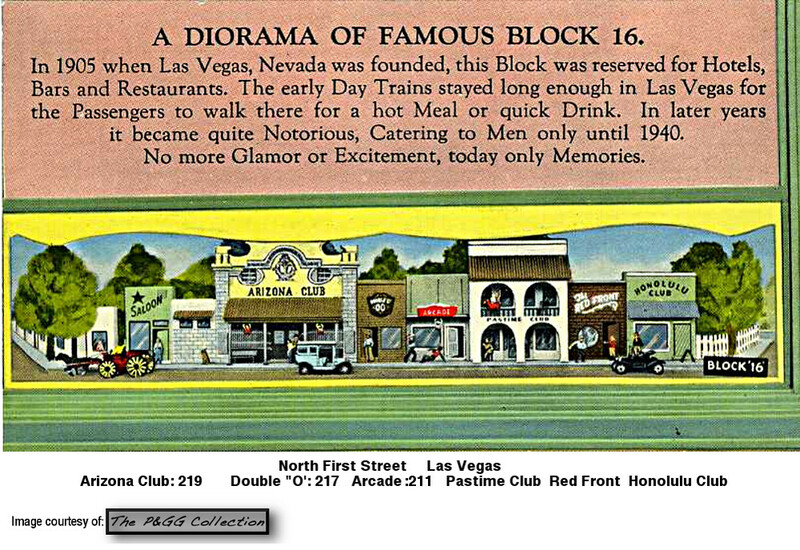 Around 1941 the army air corps advised the city commissioners, “If you don’t declare Block Sixteen closed, we will declare Las Vegas off limits.” The city commission then made a motion to close Block Sixteen. With that, Chief Frank Wait resigned, because he felt that we would be better off having Block Sixteen remain a legalized place for prostitution rather than have streetwalkers. The following day, we went down and informed them all and closed them up. The day after the closing, it seems to me that there were two people that we brought out and took down and arrested, and that was the end of it. Most of these girls—there weren’t too many of them—disappeared, as far as I know. But then it was open field for the hustlers. That’s when we had all of the problems attendant with that end of the business. It was primarily in the city that we had the street hustlers, most of them from out of town.